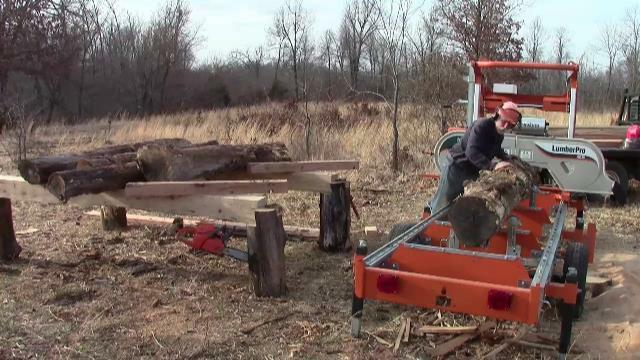 Getting logs onto the sawmill can be one of the most difficult parts of sawmilling. Whether you use a ramp and winch, front end loader, or use the Force to get a 1,500 pound log on your mill (ok, so I’m still working on the Force), having the logs on a raised deck ready to roll onto the mill is a real time—and back saver. with the log in place, the bridges are removed so that there is a walkway between the mill and the deck. Depending on the size of the deck, you will have enough logs for a half-day of milling. This frees up your loader for moving slabs and lumber. It may also prevent damage to the mill from dropped logs or bumps from the loader. Log decks come in a variety of sizes and degrees of automation. “Live” decks have conveyor system that moves the logs forward with the push of a button or lever. They are typically found on production mills. They move all the logs each time they load one on the bandsaw mill, making it easy for the loader operator to reload it when the supply on deck gets low. A “dead” log deck, as the name implies, requires a little manual effort to roll each log down the deck and onto the mill. A slight downward angle helps gravity feed the log. It is still a huge improvement over lifting each log onto the mill individually. The log deck presents many opportunities for keeping tools out of the way, but close at hand. The other term you may encounter is “strands”. These are the rails of the deck. The simplest decks have two strands, but some have three for more stability and to accommodate different lengths of logs. 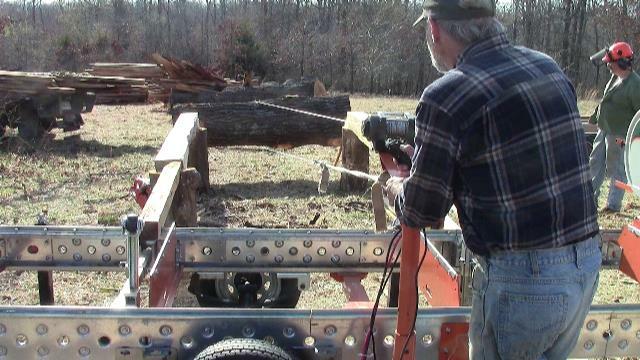 For most purposes, a two-strand deck is adequate for small sawmills. The ideal log deck would be welded pipe with each strand self-supporting so that you can pick it up and adjust it—or move it completely out of the way—with a front end loader. This has been on my to-do list for some time, but other things always seem to take priority. Besides, the “temporary” deck works described in this article works quite well—it is just not as easy to move as I’d like. 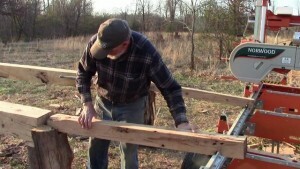 There are several key elements to building a log deck. First and foremost, it must be stout enough to handle several tons of logs. 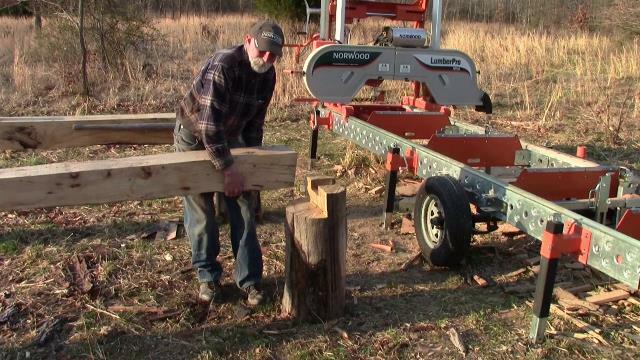 It should be at just the right height that logs roll gently onto the sawmill. Finally, the supports need to be solid enough that it has no tendency to tip. Planting the supports in the ground would help, but at the cost of being able to move them. Large stumps (at least 24” diameter) resting on the ground work just fine. Loading the deck with an 8N Ford tractor and front end loader. This loader is limited to about 600 pounds. The supports next to the sawmill should be about 30” from the frame of the mill, to provide a walkway, and the tops of the strands should be about 2” higher than the mill to provide a slight incline so that the logs will roll easily onto the bunks. The bottoms of all supports need to be cut square so that they don’t tip. I used 8”x8” oak beams for the strands, with the rear supports 6” higher than the front ones, to give the deck a slight incline, making it easier to roll the logs onto the mill. I have the strands about 6’ apart, so that they will easily hold an 8’ log. The removable “bridge” between the deck and the sawmill is a 40” long 4×4, which fits in a notch in the front supports. 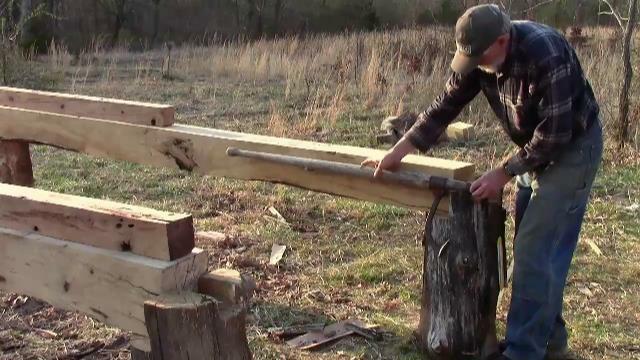 The part of the bridge that rests on the sawmill frame is notched so that it can’t slide out of place while a log is rolling over it. Some people hinge the bridge boards, and I’ll probably get around to it one of these days, but for now, I just remove it when I’m not rolling a log onto the mill. The bridge fits in the notch in the support and is notched to rest securely on the track without slipping. As an additional feature, I have the ends of the deck notched so that I can attach a ramp to winch logs up onto it. That gives me a way to load logs heavier than my old 8N Ford can lift. You should also make a pair of wedges cut from a 6×6 at a 45 degree angle. They allow you to reposition the log on the deck if it isn’t rolling straight. This is particularly useful on logs with a lot of taper. Put the wedge under the end of the log that is too far forward and turn the other end with your cant hook or winch. The log will pivot on the wedge and straighten right out. For the sake of safety, never position yourself between logs or in a place where a falling log could injure you. When rolling logs with a cant hook, roll them from the end, with your body positioned outside the strands. If you need to position the wedge or turn the log from the other end, walk around the deck, never under it. When loading the deck, I put the chalk in place to make sure the log doesn’t roll too far. 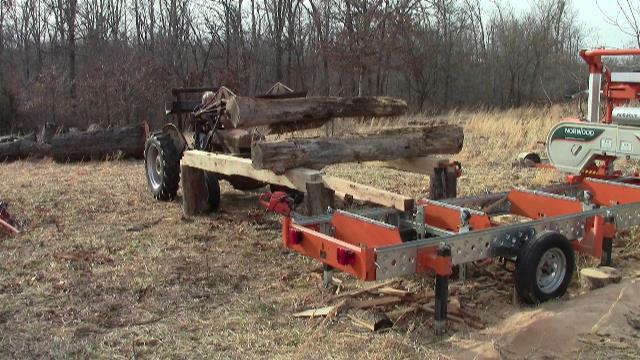 A winch and ramps make lifting heavy logs onto the deck a simple job. There are many ways to customize the mill to the way you work. For example, I cut a notch in one of the front supports to hold the chain saw, and put in some hangers for the cant hook. It may take several tries to get it right, but the savings in time and effort make it more than worthwhile. It took me about half a day to build mine, not counting the time it took to mill the lumber for the strands. I believe it paid for itself the first time I used it! If you decide to build one, why not post a picture of it on the Norwood Connect forum?